SEAT is looking to re-establish its hot hatch credentials in 2017 with the launch of its most-powerful production Leon Cupra ever. Badged Cupra 300, the new model will arrive in March and boast - yep, you've guessed it - 300PS. Pricing and technical specs are still to be confirmed, but the Leon Cupra 300 will most likely start in the region of £30,000 for the hatchback and £31,000 for the ST estate. Both will be capable of covering 0-62mph in five seconds and, like the standard Leon Cupra, the top speed will be electronically limited to 155mph. The uprated 2.0 TSI petrol engine only produces 10PS more than the standard Cupra, although maximum torque gets a 30Nm increase to 380Nm from 1800rpm to 5500rpm. As before, power is channelled through a six-speed manual gearbox to the front-wheels for hatchback versions, while the ST estate gets four-wheel drive and a six-speed DSG automatic gearbox. All versions feature SEAT's dynamic chassis control (DCC), with customisable driving modes and electronic self-locking differential as standard to improve traction in the corners and under heavy acceleration. 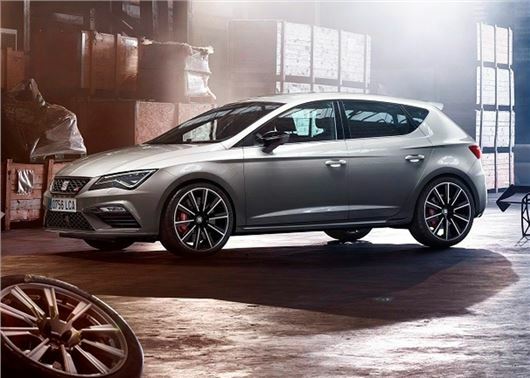 The Leon Cupra 300 will be supplied with SEAT's latest safety systems, with lane assist, adaptive cruise control and traffic jam assist - the latter allowing the vehicle to effectively drive itself in slow moving traffic. An eight-inch colour touchscreen will also be included, along with navigation, smartphone connectivity and wireless charging for mobile devices. UK pricing, specification and full technical information for the Leon Cupra 300 range will be confirmed in the coming weeks, with the proverbial order book creaking open in January, ahead of its March 2017 showroom launch.